Shawn is no stranger to the life-changing impact a highly-skilled assistance dog can provide. 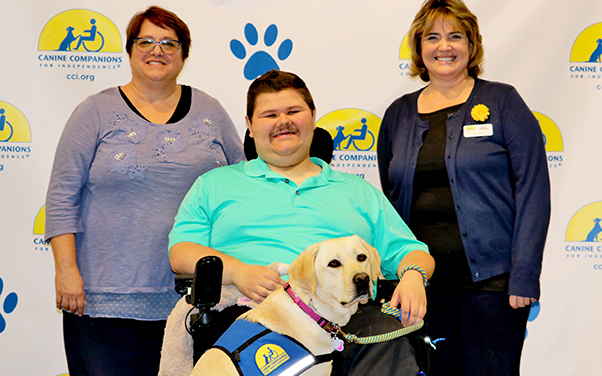 At age 6, Shawn was diagnosed with Duchenne Muscular Dystrophy, a progressive muscle disease and he has since grown up with a Canine Companions® dog by his side. When his first assistance dog retired, Shawn was partnered with Service Dog Melissa. This new match marked Canine Companions’ 6,000th graduate team. Read more about how Service Dog Melissa is helping Shawn. Canine Companions puppy Waldo had a great 2018! It was full of new experiences, lots of fun and plenty of love. Check out our most recent blog post to see his adventures. Never miss an update and subscribe to our blog! A Big 2018 Thank You! Thank you for your generosity in 2018! Your support made it possible for us to place 337 expertly-trained assistance dogs free of charge to people with disabilities. Watch this video to see the smiles you helped create! In 1988, Mary Jane Irwin started giving a modest gift annually to Canine Companions. After her death we received a gift of $475,000! Learn how you can help change lives—find out more about planned giving. DogFest events are popping up around the country. Join us! Order Mutt Lynch Winery's Canine Companions puppy label wine and 25% will be donated to us! There's something for everyone at Canine Companions. See how you can get involved. Have you visited the gift shop yet? Check it out! You can order your 2019 Puppy Calendar for a discounted donation of $15 and get $60 in coupons.